A blog covering all aspects of technology including Cloud Computing, Big Data, Distributed Applications, Mobile Computing, Personal Computing and Cloud Services. Nearly every PowerPoint presentation I've seen in the last decade has been a colossal failure and a nightmare to endure. Nearly every person delivering said presentations has only been marginally knowledgeable about the topic at hand, often relying on random fluff and tacky clipart to utterly distract and confuse their audience. I have never known a tool to foster such incompetence and uselessness in the enterprise as PowerPoint, and I don't think I ever will. It has come to the point that if I see someone open a PowerPoint presentation in a meeting, I immediately start to question their capacity to lead. All that being said, PowerPoint is nothing more than a tool (a bad one), and each tool has a purpose. In this case, the purpose is to illustrate an idea or story to a group of people. Human beings are visual creatures, and the best way to capture the attention of your audience is to complement your words with visuals. Aside from misuse of the tool, what else can be done to remedy the scourge of 'death by PowerPoint'? I think the first thing to consider is a change of tools. While PowerPoint was the only game in town for a long time, there are much better alternatives today. Apple's Keynote (available on Mac OS X, iOS and iCloud online) and online SaaS app Prezi are two that come to mind immediately. If you want something more minimalist, Google Presentation fits the bill nicely. I still use all of Google's business apps on a daily basis. More recently, though, I've been toying with the presentation feature in my favorite app - Evernote. Evernote Presentation Mode is an excellent way to present information, in a logical way, from an app that organizes literally everything in your life. While I would love to be an Evernote Ambassador, please note that I do not receive any kind of pay from Evernote, and I have a full paid subscription that I gladly pay every year. I especially like Phil Libin's take on how he wants Evernote to replace Microsoft Office. He acknowledges that Excel is the one decent piece of software in the suite, but that most people use it to organize lists or do simple manipulation of data. I can attest to this. Aside from a select few who use Excel for very complex numerical data manipulation, most Office users would be better off using a tool like Evernote as their single collaborative workspace - for everything. At the end of the day, I'd like to see the enterprise adopt better tools than PowerPoint for presentations. I really hope tools like Prezi and Evernote take over the enterprise space, but again, these are just tools. Learning how to properly craft and deliver a presentation are vitally important. For more information on that topic, see: 5 Rules for More Effective Presentations. Use these rules, no matter what tool you choose to use. While I agree that 99% of the Power Point users need to be shot, drawn, quartered, keel-hauled, water boarded, burned at the steak and then revived to have it all done again and again for all eternity (are you getting the impression that I have some issues here? ), I think that the users of Prezi are actually WORSE! Have you ever watched a Prezi with multiple zooms in and out, twists, turns and mindless effects that were never available to the idiotic Power Point user? I have been on roller coasters that have made me less dizzy! But anyway, I agree with Michael Hyatt (your link at the bottom)… as a college professor I get to see all sorts of what NOT to do (along with some pretty good work) and applaud you for trying to get people to see the light. No matter what tool is chosen its use is only as good and effective as the ability of the person using it. Skill in using a tool can range from novice to master craftsman; and the quality of the product usually demonstrates the level of skill. In a matter of time it will be "death by Prezi" or "death by Evernote" or "death by Keynote" or "death by Google Presentation" as more people turn to using those tools and fail to present their message; relying on the medium to give the message instead of them presenting an indepth knowledge of their subject matter with the medium used as support. Oh yea, I still remember "death by the overhead projector slide show." I guess I don't understand how substituting one presentation tool (PowerPoint) for another (Keynote, Presentation) will make presentations better. Perhaps you didn't have enough space in the article to elaborate? 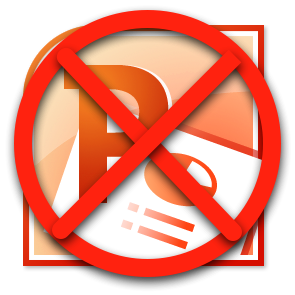 I completely agree with all the messages above, PowerPoint, Prezi and EverNote are all tolos but people need to know what the tool can give. I have been using PowerPoint and Prezi for a long time and both are comparables even when I think PowerPoint is still more interesting, both have the free versio and both have the Price versión with similar charges. © Copyright 2015 - Ernest de León. Awesome Inc. theme. Powered by Blogger.